It's been a while since I've done an outfit post, mainly because my trusty partner in crime Sarah hasn't been with me (sad face). But over London Fashion Week this weekend she came down to stay with me and between the shows, afternoon tea and extremely painful feet we found time to snap some pictures of the pieces we wore during the Most Hectic Few Days Of My Life. Here is what I wore to the Whistles' post show party yesterday evening at The Arts Club on Dover Street. The lovely team at My Wardrobe kindly supplied me with a few pieces, one of them being this gorgeous Richard Nicoll dress. 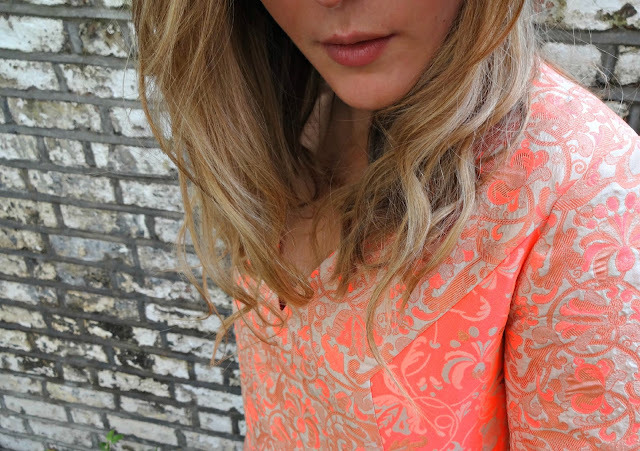 After my post on peach and gold jacquard, I've been rigorously hunting for a little piece of the trend. 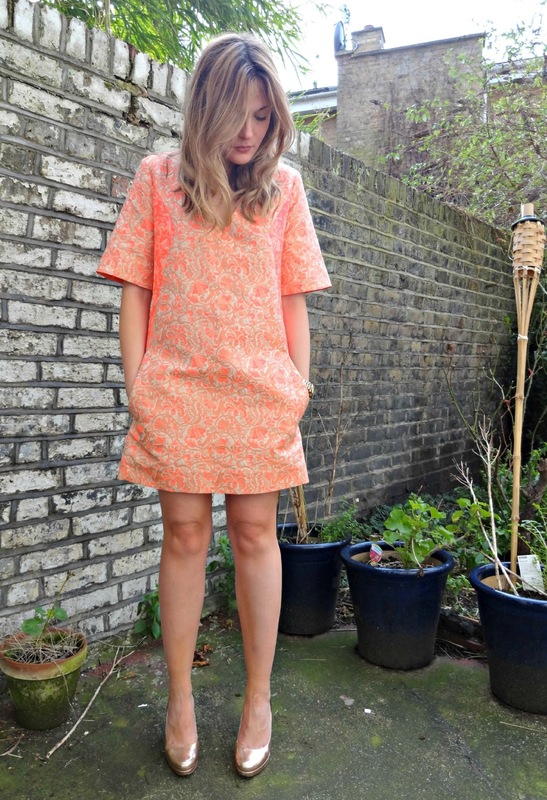 This piece is a My Wardrobe exclusive and ticked all the boxes for me - really easy to wear. I paired it up with my cheeky sale bargain purchases, some Russell and Bromley Sledge 2 heels in rose gold. I found them in their Bond Street store a couple of months ago reduced from just over £200 to £29. Yay to having tiny feet! There are always shoes left in my size... You might notice that my hair is looking a lot shorter - I've been spoilt by Sassoon Salons recently and had it chopped off a month or so ago when I popped in to their South Molton Street salon. It was a little bit daunting but they were totally right to do it, my hair feels so much healthier now... Right enough of my waffling, on to the next day of Fashion Week - wish me luck! OMG jealous at the price of your dress! What an absolutely gorgeous dress! The colour isn't neccessarily an easy one to wear but with your beautiful blonde hair and golden complexion, it's just perfect! Wow wow wow, I love the whole look! 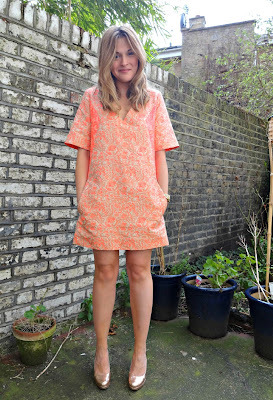 That dress is beautiful plus it's great to see brocade in such a Spring colour palette and your hair looks divine. This dress is beautiful! And your hair looks lovely, I'm having mine cut at the weekend and v.tempted to get rid of most of the length! Love this dress! Such a beautiful cut and colour. I hope you're enjoying LFW!! Beautiful! Everything about the dress works so well on you. You must have felt a million dollars! What a great dress! I absolutely love it!